Laudetur Iesus Christus! We have exciting news to share with you today. 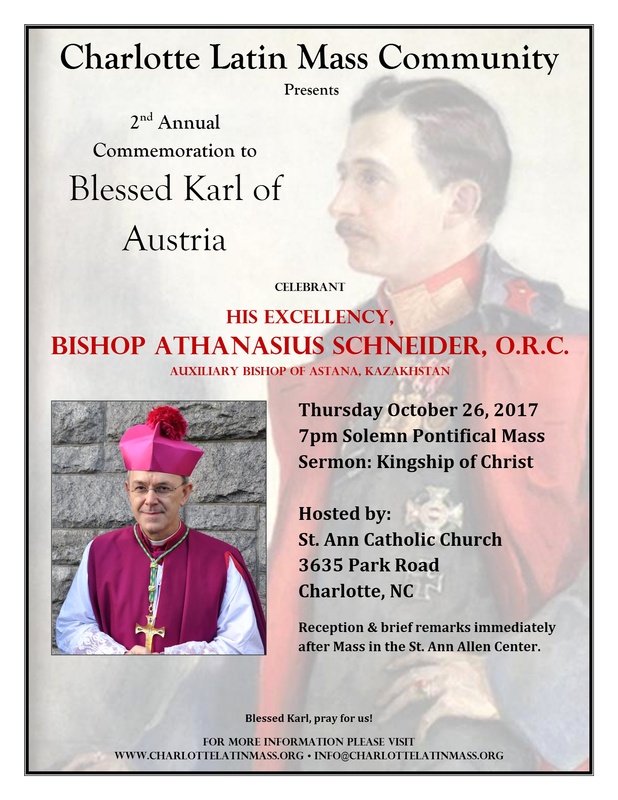 This year, for the 2nd Annual Commemoration to Blessed Karl of Austria, the CLMC and St. Ann parish have the distinct privilege of welcoming His Excellency, Bishop Athanasius Schneider, O.R.C., the Auxiliary Bishop of Astana, Kazakhstan to St. Ann parish on Thursday October 26 at 7pm. Bishop Schneider will offer a special Solemn Pontifical Mass and during his sermon discuss the doctrine of the Kingship of Christ. This Mass will be the first Pontifical Mass in the Diocese of Charlotte’s history. Immediately after Mass, there will be a light reception in the St. Ann Allen Center where Bishop Schneider will offer some brief remarks about the Kingship of Christ and Blessed Karl. Unlike prior events, the main talk will be the sermon during Mass. Time will be limited during the reception (no Q&A) but we hope there will be time for you to chat with the Bishop individually. If you’re unfamiliar with Bishop Athanasius Schneider, he is one of foremost defenders of the Catholic faith in the Church today and a defender of the Holy Eucharist (he promotes reception on the tongue and kneeling). Bishop Schneider is of German descent, but grew up in the Soviet Union and later moved to West Germany. This will be a historic visit and event for the CLMC, St. Ann parish, and the diocese. Thus, please offer some prayers the event goes well and is fruitful. Blessed Karl, pray for us!